Discussion in 'Boats, Blinds, & Gadgets Forum' started by 2labs, Oct 13, 2013. 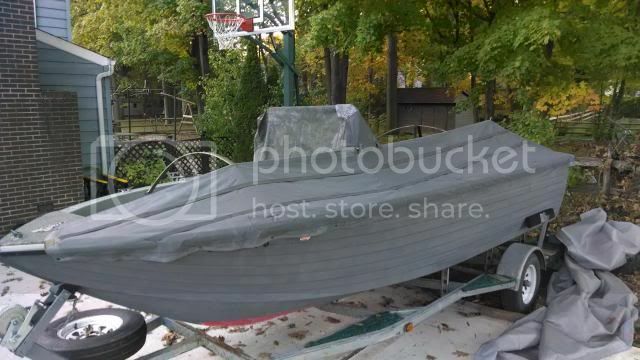 What is the best paint to use for aluminum boat? I have spent countless hours taking it 98% down to the bare aluminum. I will use a good etching primer, but want to pick a paint that will last many years, so I don't have to do this again for awhile. I have read many mix reports on Parkers paint. Maybe that is only due to poor prep work. Also, what is the best rattle can paint to use for stencil work? Again, I don't want a rattle can paint that chips or peals easily. Pettit shipendec or Lock stock and barrel are both good paints. Sherwin williams KEM 400 as well, if you can find a dealer.
" If a man speaks in the forest and is not heard by a woman, is he still wrong"
In dog beers I've only had one! I used lock stock & barrel on mine. I even painted the canvas with it. My boat is a big 18.5' and I still have a third of a gallon. If money wasn't an object, I would have tried an epoxy automotive paint. I think it would be harder. I think it was around $300 for a gallon. Another vote for Parker. Apply it over green chromate primer. I have used Pettit's two-part polyurethane boat paint over Pettit primer: it goes on easily and is tough as anything else out there (still going strong after being painted in 1991), but it ain' cheap. Adding a spin to this question: If you had to use paint from a Lowe's, is there one that is similar (in composition) to a Parker or a Lock, Stock paint? Just asking because I have some Lowe's gift cards from Christmas, that I'm going to use for a conduit-based scissor-style blind, but probably have more than enough for that, and was wondering if there was a paint at that store that would work. BEHR PREMIUM PLUS ULTRA, Exterior Latex Flat. Just make sure when they add color to it that you tell them you want it as flat as can be .